The release week October 11th Blu-ray Cover Art Gallery for 2016 features top title Ghostbusters from Sony Pictures Home Entertainment. 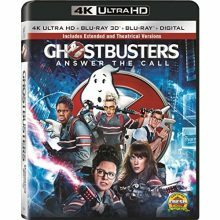 You will also find a premium release for Ghostbusters that includes both 4K Ultra HD and Blu-ray 3D formats. Sony also has the Ron Howard / Tom Hanks films The Da Vinci Code and Angels & Demons on 4K Ultra HD this week, both with remastered Dolby Atmos audio. Speaking of Atmos, the Warner Home Video title The Legend of Tarzan Blu-ray release features Dolby Atmos audio, as does the The Legend of Tarzan 3D and the 4K Ultra HD edition for The Legend of Tarzan. 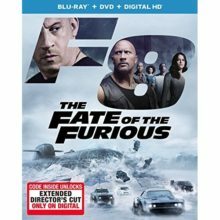 Warner also has the animated television title Adventure Time: The Complete Sixth Season, the classic On Dangerous Ground from the Warner Archive Collection, and the Amazon exclusive Middle-Earth 6 Film Collection Limited Collector’s Edition from New Line Home Cinema this week. Fox Home Entertainment’s big release is the animated sequel Ice Age: Collision Course, which is also available as a deluxe edition of Ice Age: Collision Course with Blu-ray 3D, and a 4K Ultra HD edition of Ice Age: Collision Course with Dolby Atmos audio. Also watch for Blood Father and Glengarry Glen Ross on Blu-ray Disc from Lionsgate Home Entertainment. Paramount Home Entertainment has the 70th Anniversary edition for It’s a Wonderful Life that features a colorized version along with the original black and white. Horror specialists Shout! Factory have John Carpenter’s The Thing and Brian De Palma’s Carrie in Blu-ray Collector’s Editions this week. Art house titles include McCabe & Mrs. Miller and BoyHood from the Criterion Collection, and French film Les Cowboys from Cohen Media.